When you look at a finished building made of Polycrete® ICFs, you can’t tell the difference with others construction systems and methods. The differences are great though on many topics : energy savings, sturdiness, durability, comfort, security, quality and much more. All of this is out of the box benefits when building a Polycrete® ICF structure. Polycrete® walls allow the installation of any interior finish and any siding. Remember to respect all local and national codes and rules currently in effect. Gypsum boards are one of the most common solutions. They can be fixed directly to the Polycrete® ICF fastening strips, or on vertical wood or metal furring previously installed to the ICF fastening strips. This second solution could provide an easy way for electronic and electrical service installations, but the fact to have an air gap (and wood furring) between EPS panels and gypsum boards will degrade fire resistance performances. Exterior finish brings the final esthetic aspect to a building, but they also significantly contribute to the thermal insulation performances of the wall. Exterior finish also protects EPS panels from weather element and nature. All kinds of exterior finish may be applied to Polycrete® ICF wall. It is important to follow all recommendations and installation procedures given by the manufacturer of each exterior finish. Vertical sidings can be directly fixed to the fastening strips embedded inside the Polycrete® ICF panels while horizontal ones can also be installed, but they require intermediate vertical furring. Acrylic coating (stuccos) can be directly applied on the EPS panel surface. It is recommended to use an acrylic coating with embedded fiber mesh that will provide better strength and will prevent potential cracking due to shrinkage. Masonry veneer (brick or stone) is also a very common exterior finish possibility. It requires a brick ledge as described in section 3.8 of this manual. 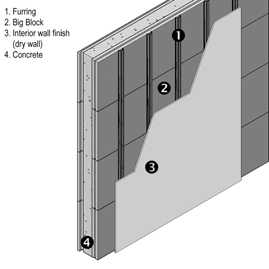 Brick or stone ties can be attached to the fastening strips of the Polycrete® ICF panels. All materials used in Polycrete® ICF walls bring thermal insulation performances above all requested codes and regulations. Insulation provided by expanded polystyrene panels directly seal the concrete walls without air gaps nor thermal bridges. This structure does not allow any airflow between exterior and interior building environment. So, there is no possible vapor formation through concrete walls, neither airflow. Polycrete® ICF walls do not require any air nor vapor barrier, except for masonry, or unless requested by local codes or structure engineer.